This is the demo that Tim Davie played at a recent conference. Folder Media’s social networking and listener management services have been contracted by the recently launched digital radio station Jazz FM. Folder is now responsible for managing all of Jazz FM’s listener queries and feedback received through JazzFM.com as well as managing and updating the content of the website itself. The service provided by Folder Media is encompassed by the slogan and policy of “no listener left behind”. This policy ensures that Jazz FM’s listener base is carefully looked after through efficient and responsive feedback to queries alongside creating web content that is tailored to fit the wide variety and tastes of jazz music fans. Folder Media is also responsible for maintaining the station’s online contesting and created and manages the listener database. Social Network activity is also a key part of Folder’s relationship with Jazz FM and we maintain profiles on the key sites. By using Facebook we connect Jazz FM with over 8 million UK users and 140 million users worldwide. The power of the site and the exposure that is available online is harnessed by establishing ‘fan pages’ and ‘groups’ which act as unique pages within the site where users of a shared interest can gather information and connect with each other. Folder manages ‘fan pages’ for popular presenters at the station allowing us to specifically target users who are fans of these particular shows, provide specific information about the show and cross-promote the station’s other activities. 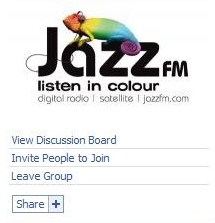 We also run the Jazz FM ‘group’ page. This is a public group that carries information about the station and can be accessed by any user worldwide. These pages and the group act as entry points for the radio station itself and also opens up further lines of communication for listeners to interact with Jazz FM. Jazz FM’s MySpace profile offers listeners another route to contact and connect with Jazz FM. As MySpace is evolving to become a social network based around music, we use Jazz FM’s presence as a way to drive awareness of the station through jazz musicians and aficionados. Often through MySpace, Jazz FM receives requests from artists requesting that their music is sampled on the station or put forward to the presenters. Folder responds to what can be often large volumes of requests from artists and often simply through responding to a request we establish a ‘friendship’ with the artist and deepen their connection with Jazz FM. A trio sending in music to the radio station is not just an opportunity to grow the station’s repertoire, but the opportunity to add three more listeners to the radio station. On Last FM we offer listeners the ability to see which artists the station plays on a regular basis and to see the most recent songs played. For a specialist music station such as Jazz FM, Folder has found that this undoubtedly offers listeners a really useful option that many other stations do not provide. The nature of the site means that when the station regularly plays music from a particular artist, the station will appear on that artists profile page, allowing new listeners to discover and sample the station. The site also generates ‘neighbourhoods’ – people who listen to the same types of music as Jazz FM, once again driving awareness of the station. Through managing the responses on the social networks and from the listener emails, we can take the temperature from listeners about music, features and on-air activity and discuss that with the station direct. Also, by making Jazz FM responsive to feedback, the barriers between listeners and the station is broken down. Folder is confident that engaging with listeners on as many platforms as possible has in return, improved and sustained listener dedication to Jazz FM. This has given the station a positive reputation amongst the jazz music community as an open and non-elitist portal for jazz information, ranging from gig guides to suggesting our favourite Christmas jazz tracks. Folder Media has just turned a year old, which surprised us all as we still think of ourselves as a new company. Looking back over the first year though, we’re very pleased with what we’ve accomplished in such a small period of time. I think as with most start-up’s you’re never exactly sure about the scope of what your new business will be. We always knew that MuxCo would form a big part of it, but we’re pleased how our activities have grown into the six areas that you can see on the right hand side. We also think that those six things set us apart from many other ‘radio consultants’ in the UK with the key difference being that we don’t concentrate on traditional radio programming. There are lots of very good consultants who can help with morning shows or Selector, but we think for stations to be successful in today’s modern world it’s important that groups get the right digital strategy sorted out and build the correlistener iqoption recensione marketing tools to ensure they can do well from ‘new’ revenue sources straight away. We’ve been spending quite a bit of our time on DAB related projects at the moment and not only through our multiplex management responsibilities. We’ve had lots of enquiries from people wanting more information about going onto DAB multiplexes. It’s always easy to be distracted by some changes from the larger groups, but we’re seeing for new operators that DAB’s 10% radio share and growing penetration make it a viable business for new entrants. We think 2008 will be the year of new entrants for DAB. Many of our client relationships start with a phone call. Whatever you project, give us a call, and we’ll happily talk through some options and how we can help you.